My family's last name is Grill...so as you can imagine, we don't mess around when it comes to BBQing. Many of my family's signature dinners involved my mom in the kitchen and my dad on the porch, the two of them working together as if performing a well-choreographed ballet duet. Passing back and forth with a slap of the screen door, my brothers and I sometimes running between the two, season this, take it out to dad, hold the platter while he transfers things to the grill, take it back to mom for rinsing. A common favorite in our house is the Grill Mixed Grill, which involves any manner of meat and seafood piled high on a platter. Grilled swordfish steaks was another summer regular. But today, in honor of this most American holiday, I bring you our family burgers. Simple but perfect. Like a summer afternoon on the porch. Maggi seasoning is our subtle secret touch. Don't tell my dad I told you. It's similar to soy sauce, and adds a little tangy saltiness. We simply douse the meat with little of that, Italian seasonings, salt and pepper. No chopped additions or cheese infusions or stuffed patties...as Bobby Flay has said, that's meatloaf. We keep it simple with a few light seasonings, and let the juicy meat speak for itself. The photos here show sesame buns, but my father would find it critical to point out that he always serves his burgers on oversized English muffins. We use a mixture of about 1/3 ground lamb to 2/3 85% lean beef. Combine the meats in a large bowl that you can season and mix in. Precise measurements aren't necessary. I usually add enough seasoning to liberally cover the top of the meat (about 10 shakes of Maggi seasoning for a couple pounds of meat), then mix it with my hands. If the seasonings seem to have really disappeared when you mix it, add a bit more and mix again. The Maggi sauce and Italian seasoning both have salt in them, so be more sparing with the salt at first than you might otherwise be. Take a palm full of meat and pat it into a disk. Press a thumb into each patty before throwing it on the grill - this prevents the burgers from puffing up into a ball shape. I won't go telling you what condiments to use. There's a strong mayo vs. ketchup debate that ensues in our house. Use your democratic right to choose and top 'em however you like. 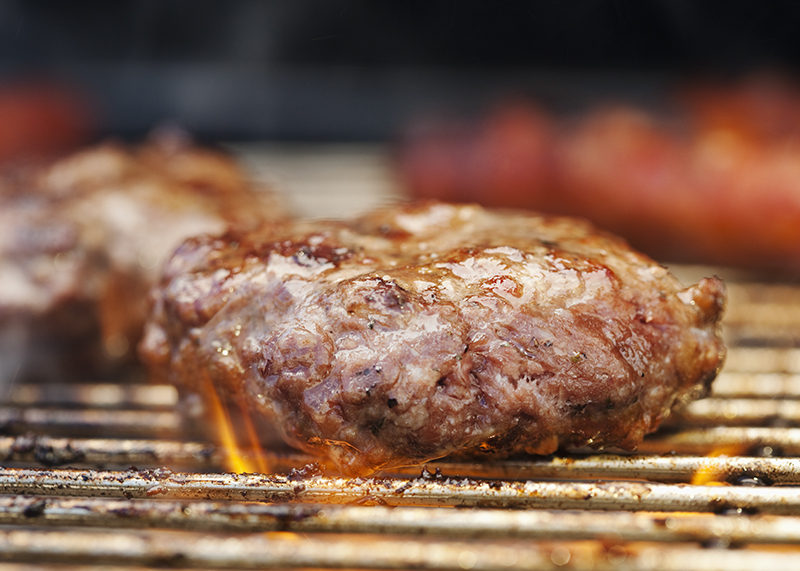 Wishing you warm days and juicy burgers this holiday weekend...Happy Fourth!